GITE WITH ANCIENT STONES & BEAMS SHOWING 50m2 + LARGE TERRACE OVERLOOKING POOL. Specifically conceived for 2 people. No other gîtes or B&B on the property as it is often the case. Ideal for quiet relaxing days in the garden and by the pool, for walking through the surrounding countryside, or visiting France. Spoiled for choice in the Dordogne (Périgueux, Bergerac, Brantôme...), Charente (Angoulême, Cognac...) and even the Gironde with lovely St Emilion and magnificent Bordeaux : The Choice is Yours! - Private Pool Heated 9mx4m for the 2 guests to use only, lights at night. (Use by the owners in your absence / Cleaning done by owners when present/available or material and instructions left for guests). - 1 Large Terrace (only 5 steps) overlooking the pool. - 1 Double Bedroom with a comfortable 160cm bed & modern bathroom en-suite with a shower and a big bath. - 1 separated toilet with handbasin. - 1 washing machine + iron + table. - 1 kitchen fully equipped (built-in diswasher, fan oven, microwave, fridge/freezer, induction hob, Nespresso coffee machine Pixie, kettle, toaster etc. - Air-conditioning unit for those ever so hot days/nights. - BBQ, Salon de jardin, sun loungers, 2 parasols. - 2 bicycles available for guests to use. - Bio vegetables and eggs direct from the farm just down the road. - Markets nearby (Sunday, Monday, Friday) and in season, night markets with local producers selling food you can eat there/or take away. - Smoking is not permitted in the Gîte. - Saturday is normal changeover day (arrival after 4pm) and departure (before 10am). - Please Bring Your Own beach/pool towels. The Gîte is independent and next to the owners home. Both have been tastefully renovated by the owner (half french, half english tradesman). It is facing the pool which will be for your exclusive use (no other guests). The owners (lady is french) will make sure to respect your privacy by using it when you are not around. The standard seasonal short-term contract will be sent to you by mail ; you will need to scan it and return it duly signed by mail in order to book the gîte. The booking will then be confirmed when documents with your details and signature received by us. Merci/Thanks. We are always available for our guests and ready to help in any way we can to make their stay the most pleasant one. We will also make sure we do not interfere in your privacy as much as possible. Tastefully renovated by the owner, "Douce France" will seduce you, no doubt. Specifically conceived for 2 people (no other gites or B&B on the property as it is often the case). Living around here feels like being on holiday all year round ! Our wonderful guests who enjoyed our seasons in 2016, 2017 & 2018 kindly gave us excellent comments which might help you with the choice of our Gîte "Douce France". Bonnes vacances à vous aussi et à bientôt! Bedlinen and towels included (2 bath towels and 2 hand towels) Please BRING Your Own Beach/Pool towels. 1 confortable sofa for 2 (non convertible). Expresso coffee machine : Nespresso Pixie. Please bring your Nespresso Capsules (not provided). French and english books. The french lady owner can help you with your french too, if you wish! In the local bar in the village 3 mn away. Very large terrace by the Gîte & by the Pool with shaded area. 2 Parasols available. In Aubeterre, 3 mn away. - The Gite is equipped of electric roller blinds. - The Final Cleaning Service of 50 euros (mentionned in the rental agreement) will be paid directly to the owner upon arrival. A very well equipped comfortable gite. The pool was very nice. A rural location surrounded need by cows and fields yet very close to Aubeterre. Marie and Louie the owners could not have been nicer. I would highly recommend this gite. Wonderful, relaxing, high quality and lovely property in a great rural location. We have stayed in several gite's over the last few years and have come to identify the things that make a good property great. Douce France is great as it has been designed and equipped to a very high standard. As a property for two, having a private pool is unusual and very welcome. The pool is bathed in sunshine throughout the day and well into the evening and even has a jet-spa area. A covered seating area next to the pool was a real bonus when the temperature hit 38c and it was too hot even under the umbrellas'. The property is finished to a very high standard throughout, with everything new. It was immaculately presented and clearly the owners are very proud of what they offer. When we arrived, Marie had identified some events that were going to be on during the week we were there and helped with some ideas of where we could visit. It's a converted stone barn, so keeps cool anyway, but is also equipped with air conditioning when the temperature gets too high. The shower and bathroom is hotel quality and the bedroom plenty large enough for two, with wardrobes and draws. The living area is a combined kitchen / dining area and lounge. Eating in at some gite can be a frustrating affair, but we were delighted at the little touches like knives that were sharp, a very fast and powerful induction hob, a good oven and plenty of good quality cutlery, crockery, pots and pans. For entertainment, there is a DVD player, satellite TV and WiFi, plus a lovely outside area that effectively extends the kitchen / lounge area onto a large terrace overlooking the pool. Under the terrace is a covered parking area, and bikes are available to ride into the villages or exploring the area. The property isn't in a village, but sits on a very quiet road surrounded by fields. Auberterre-sur-Dronne is a 5 minute drive away, Bonnes and Saint-Antoine-Cumond are slightly closer. The night market at Auberterre is delightful and the town has plenty of places to eat, shops, and history. We visited Brantome for lunch one day, and on another went to the Cognac region, both an easy day out on roads that were much less busy than we found a week later in the more central Dordogne areas. Riberac is the closest main town and worth a look around. We often end up booking properties for 4, despite there being only two of us to get somewhere we want to be with the facilities we like. Douce France was a real gem and well recommended. We recently stayed in this beautifully restored barn belonging to Marie & Louis. They have gone to great trouble to make it feel homely yet modern with quality fittings. On our arrival, they both made us feel very welcome, & were wonderful hosts, throughout our holiday, right up until the morning we left, and were discreet yet available. 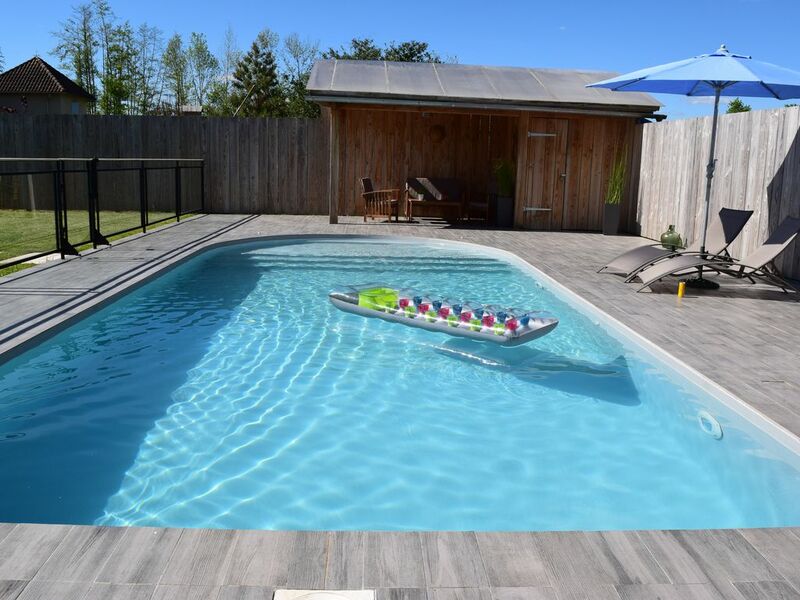 The gite has everything you could wish for including a gorgeous pool and is all kept spotlessly clean. You really couldn't wish for more with plenty of space for two and lots of little details that make it feel a real home from home. We like to cook on holiday and normally feel there are lots of things missing in a kitchen but certainly not here. The gite is in an ideal location not far from Aubeterre sur Dronne which is a beautiful little village with plenty of places to eat. Aubeterre is easy to cycle to as is the nearest boulangerie for your morning croissants or canoe's for hire in Aubeterre. We certainly hope to go back soon. The advert did not do the Gite justice, Marie & Louis have thought of everything, excellent doesn't describe it. The location wonderful, just a bike ride to either of the local villages for bread in the morning or into Aubeterre for a choice of meals in the evening. Wir hatten das Haus (leider nur) für eine Woche gemietet und wurden sehr herzlich von Marie und Louis empfangen. Beide sprechen auch Englisch und sind sehr nett. Nicht aufdringlich, aber herzlich und hilfsbereit, wenn Hilfe benötigt wird. Das Haus ist tipptopp in Schuss, alles (fast) neu und v.a. durchdacht - es fehlt an nichts, alles ist sehr sauber. Sehr gutes Bett, tolle Dusche. Große Terrasse mit Blick auf den Pool und in's Grüne. Wir waren für uns und konnten super ausspannen. Die Umgebung ist sehr schön, man ist schnell in schönen kleinen Dörfern oder beim Bäcker. Eine Stunde bis z.B. nach Saint-Émilion, Périguex, - aber wir fanden es so schön im Haus, da wollten wir einfach nur dort bleiben und alles genießen. Wir empfehlen es 100%ig weiter und kommen bestimmt einmal wieder, dann aber länger. Un hébergement tout neuf, très confortable (merci la clim), une literie à la hauteur, et une piscine à 27, nous avons tout apprécié et encore plus la gentillesse de Marie. Mêmes les hirondelles voulaient en profiter (aller et retour dans le logement). Nos vacances ont été superbes, que de beaux souvenirs pour les mois à venir. Merci mille fois. Canoe hire available, walks, cycling, golf facilities, tennis, horseriding and many other leisure activities in the area. Only 3 mn away from 3 villages : St Antoine (Dordogne), Aubeterre & Bonnes (Charente). You will be spoiled for choice for where to get your croissants, pain et baguette!! In between Dordogne (Périgord Vert) & Charente, 3 mn from Aubeterre (amongst the most beautiful villages in France with its monolithe church), 40 mn from Brantôme (Little Venice du Périgord), Bergerac, Angoulême (International City of "Bande Dessinée").